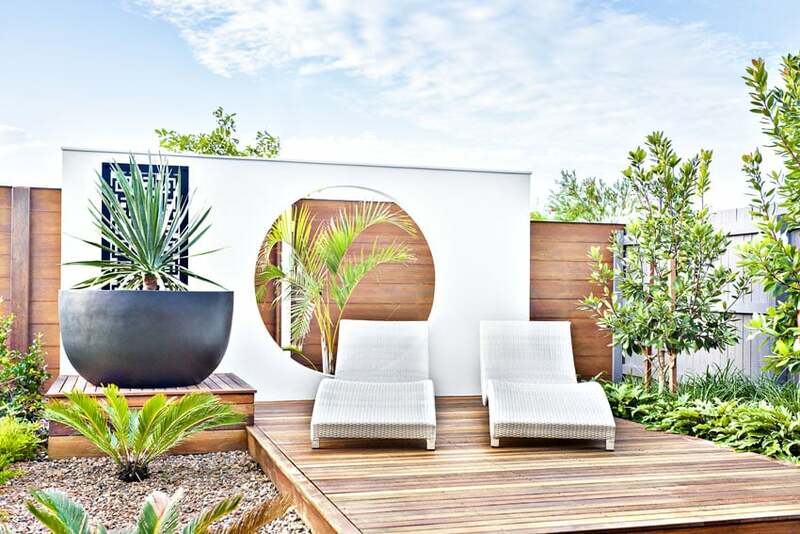 Welcome to our gallery of top modern deck ideas. 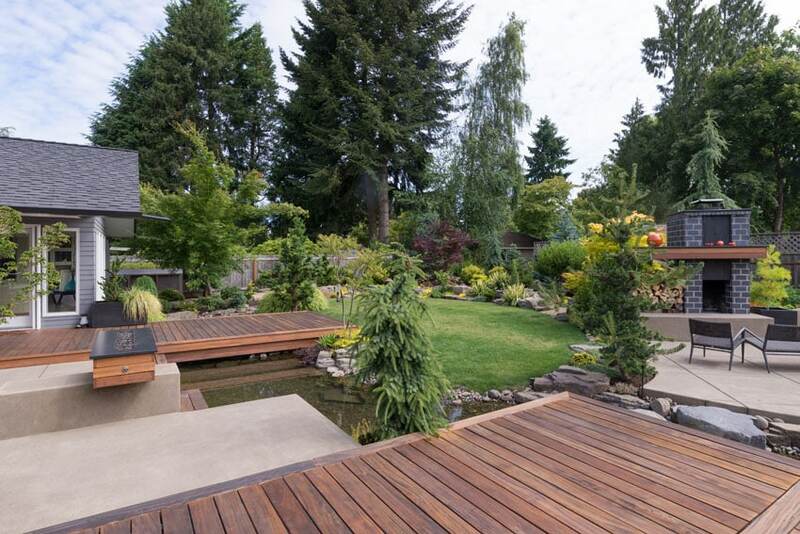 These decks feature a variety of styles, outdoor furniture and landscaping to help inspire your own backyard designs. Whether you have a pool, a garden, a pond or a simple patio on your backyard, adding a wooden deck is a stylish and trendy element you can easily install and incorporate into the design. Adding a deck somehow adds an interesting point to the space, frame certain areas, and add more dimension to the outdoor area. 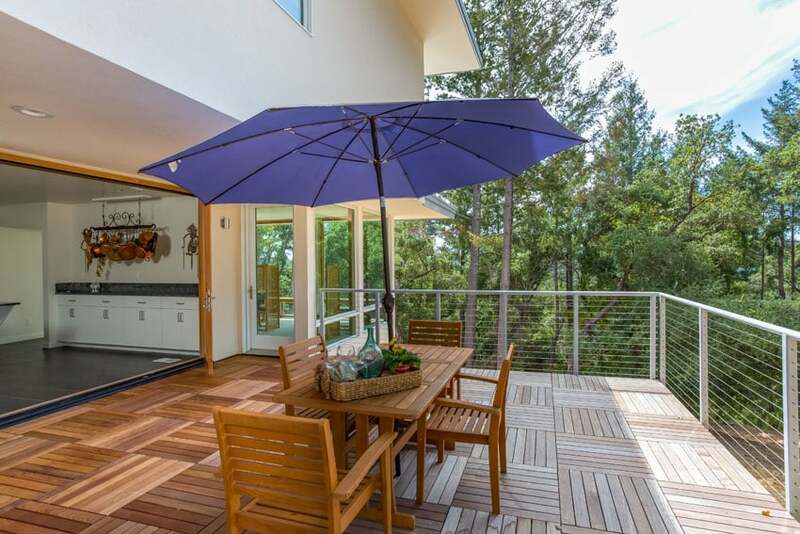 Decks are gaining popularity due to its ease of installation and its added aesthetic value. Modern designs, especially look good with modern decking, and there are a variety of styles and materials to choose from. 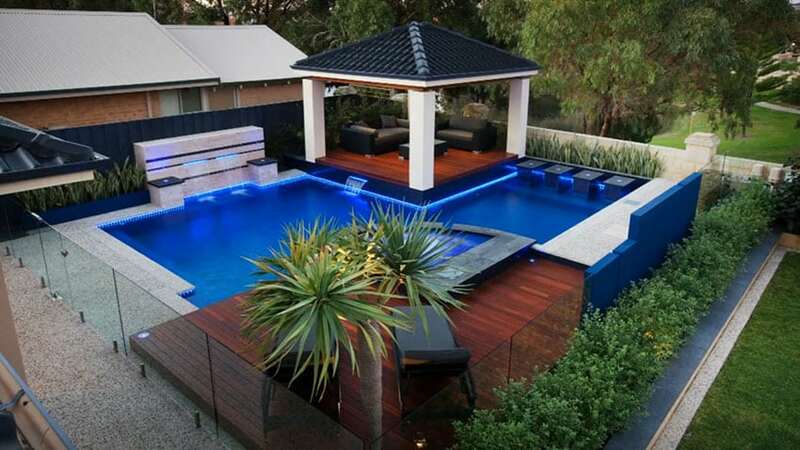 The modern pool-side wood deck design shown in the picture above uses solid Mahogany decking and framing. The wood deck planks has grooves to give it its surface more grip for both furniture pieces & for the users. Placed right beside the minimalist pool area, it adds more dimension to the otherwise flat layout of the pool-side. The deck is slightly elevated, and has integrated outdoor in-ground lights, which helps emphasize the area. It has also been furnished with lounge chairs and a canopy sofa for added functionality. 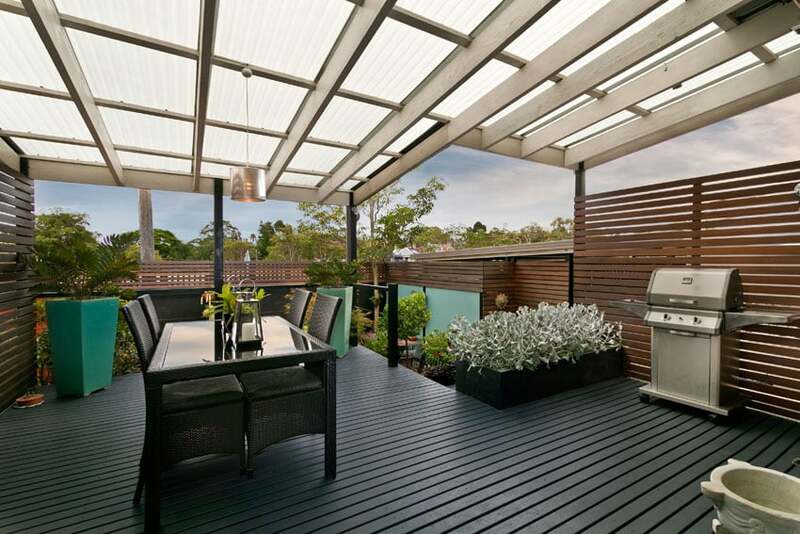 Aluminum – a rot, rust, crack and warp-proof decking option which is also very durable and weather resistant. The down-side of this materials is that it is the most expensive out of all other decking material options. Solid Wood – there are a variety of wood appropriate for decking to choose from in the market, some of which are redwood, cedar and some tropical wood imports. They are also hard, durable and resistant to rot & insects (depending on wood specie). This type of decking gives a warm & natural appeal, is less expensive than aluminum, but needs to be maintained by washing and finish recoating every three to four years. Pressure Treated lumber – if you want that wood finish but is a bit tight on the budget, PT lumber is the most economical choice of decking material. They are usually chemically-treated so that they become weather resistant, however, note that PT lumber has a tendency to crack/split/warp, especially if you use long spans of planks. It also requires maintenance similar to solid wood decks. Composite boards – these decking material is made of recycled plastic and wood fibers to create a composite material which looks like wood, but is more lightweight. While they do not require sanding and recoating like other wood materials, they are, however, susceptible to mold and mildew, so regular cleaning is advised. Plastics – this is similar in look with composite boards, but these are made from 100% plastic. 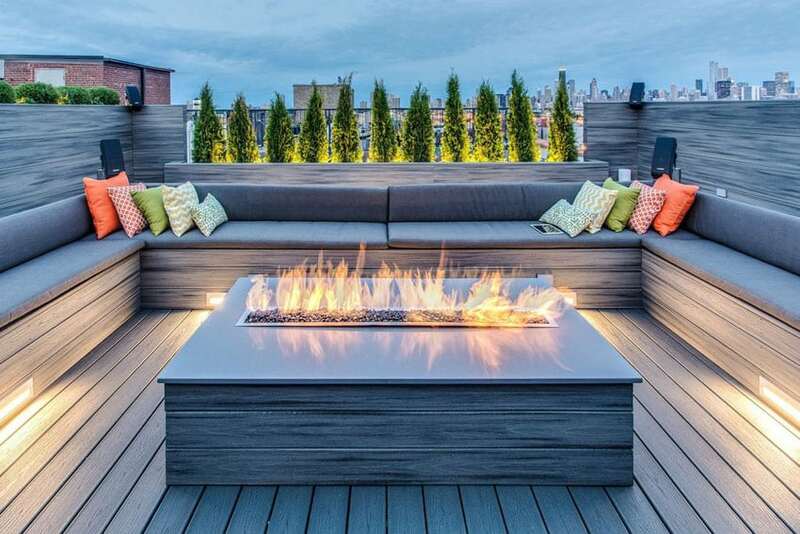 Fire pits – a popular element on patios both on traditional and modern designs. These adds an interesting focal point to your space, and gives that elemental contrast especially if you have a pool or any water feature nearby. See more fire pit design ideas here. Furniture – whether built-in or loose, adding trending outdoor furniture to your deck makes it more inviting and engaging. It also encourages traffic so your deck’s potential is maximized and utilized. Comfy lounges, sofas or canopy chairs are some of the popular furniture pieces you can put on your deck area. Make sure you use furniture pieces with outdoor-grade materials so they won’t easily wear down. Stairs/steps – depending on the height and location of your decking, adding stairs or steps makes them more easily accessible, and also adds an interactive yet functional element to your deck design. Roof/canopy/pergola – depending on the location of your deck, adding a roof canopy to the deck area will not only help improve its look and encourage people to use the area, but will also help preserve the longevity of your furniture pieces and deck material. There are many pergola design ideas that can help provide shade and allow you to enjoy your outdoor living spaces more often. 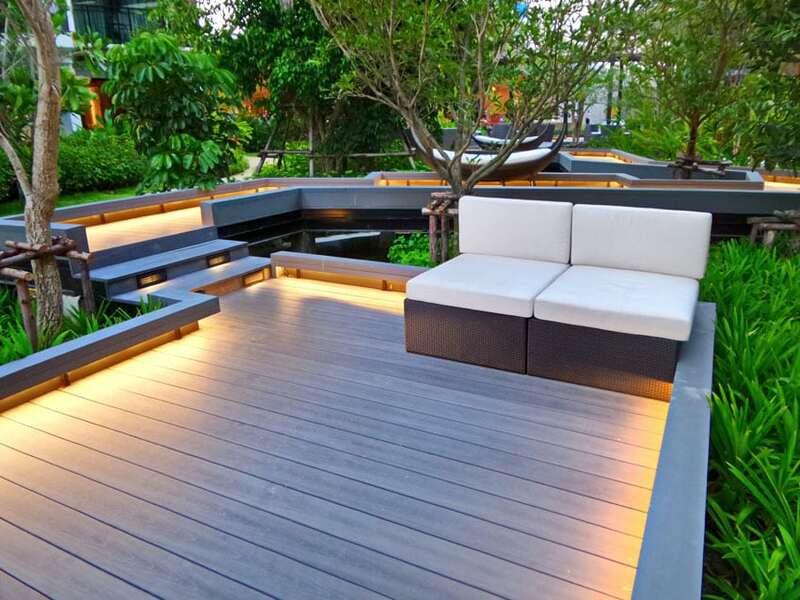 Lighting – incorporating lighting for your deck is essential, as it adds both aesthetic and safety value to your space. Ensure that you are using outdoor-grade lights for this. You can create your own designs implementing many of these features using one of the popular deck design software programs currently available. There are free options as well as more advanced programs depending on how detailed you want to get. Using one of these can help give you an idea of the exact features you want as well as save time and energy when hiring a contractor to bring your plan to life. 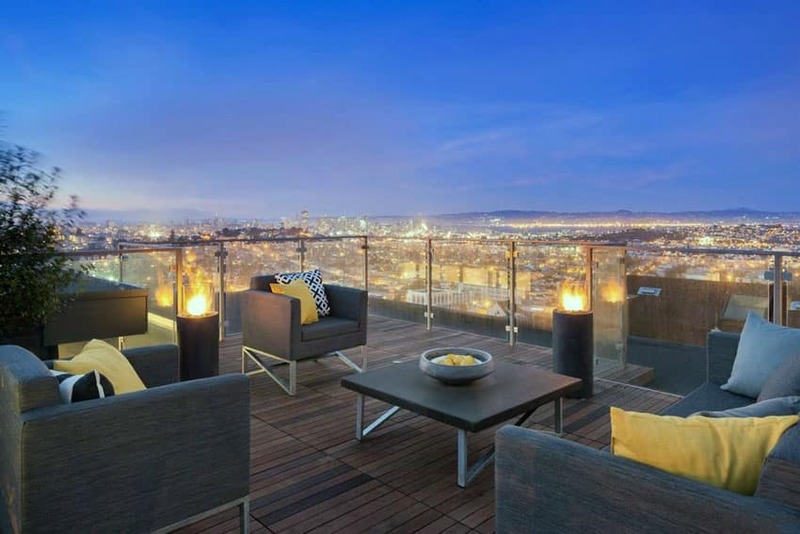 Below are some gorgeous examples of modern decks to take inspiration from. 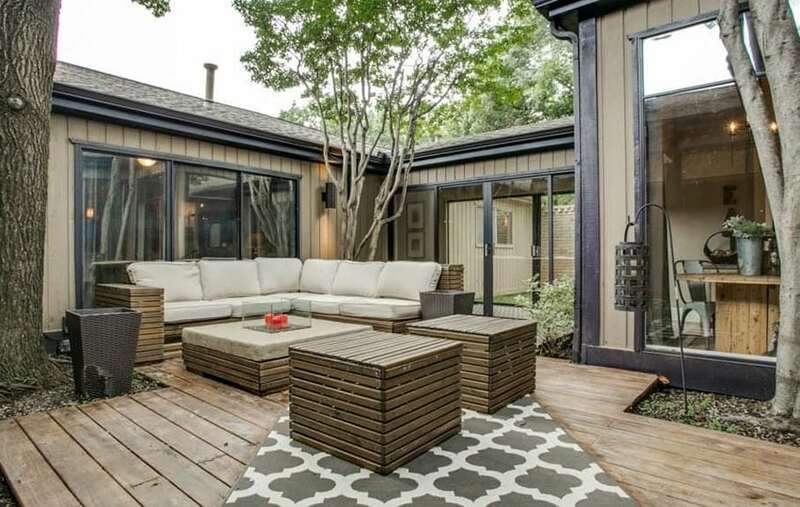 This spacious backyard features a gorgeous layout of multiple modern patios which stand on a wood deck base. This outdoor patio stands on a pebble-covered surface and is connected to each other via a solid stone pathway. The material of choice is solid wood, in a dark oak finish. Wood decks can also be applied on public spaces. This garden pathway is a great example for such. The raised pathway/walkway is slightly elevated from the ground to avoid excessive moisture to seep through the decking. It stands on a metal framework for a durable base, and uses solid wood for the decking material. 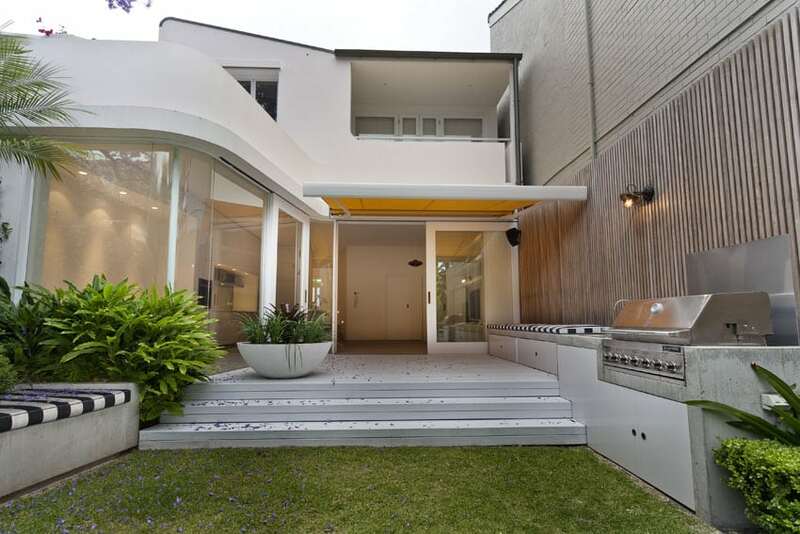 It also adds different elements such as an LED strip lighting to illuminate the side rails, stairs/steps with step lights for the higher walkways, and of course, outdoor furniture strategically placed on different corners along the walkway. 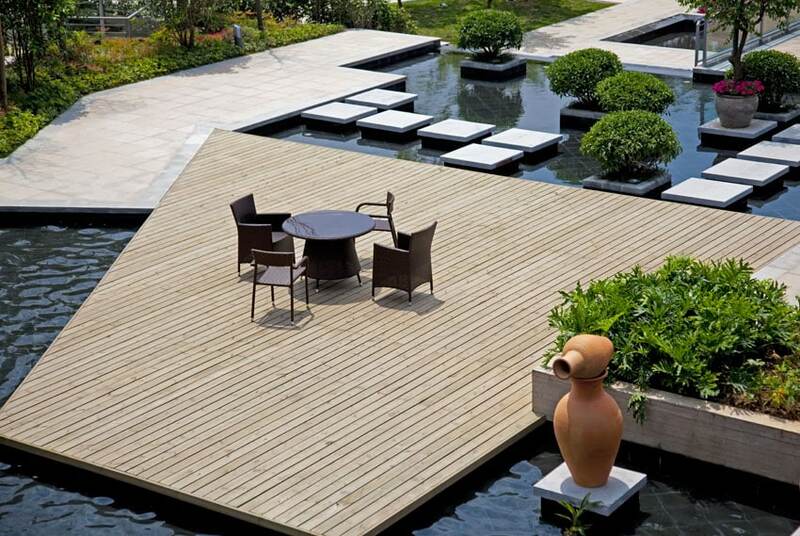 Adding a wooden deck to your water feature would also work well when planned out nicely. 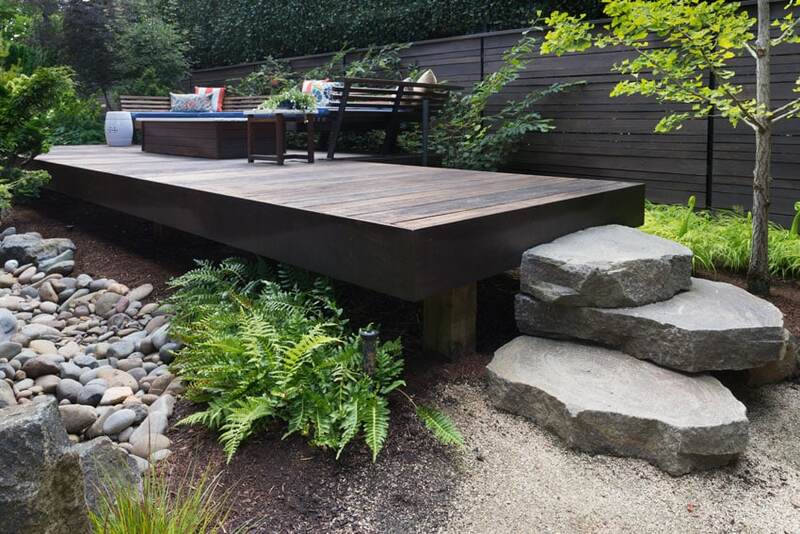 This modern water feature is a great example of such, as it seamlessly integrates the cedarwood deck into the modern, concrete-based design of the water feature. The wooden deck helps break the repetitiveness of the concrete material, and also adds more texture & pattern to the area. If you want your small patio to stand out, one way to do it is to place it on an elevated wood decking, like what they did in this example. Using solid tropical woods for both the framing and decking material, the patio area was raised at around 300mm above ground level, and is accessible through a series of steps made from large blocks for stones. To make it even more interesting, a U-shaped built-in bench was also added, along with other loose furniture items to decorate the area. In this example, you will see 2 different areas of application and 2 different materials of wood decking used in the same area. 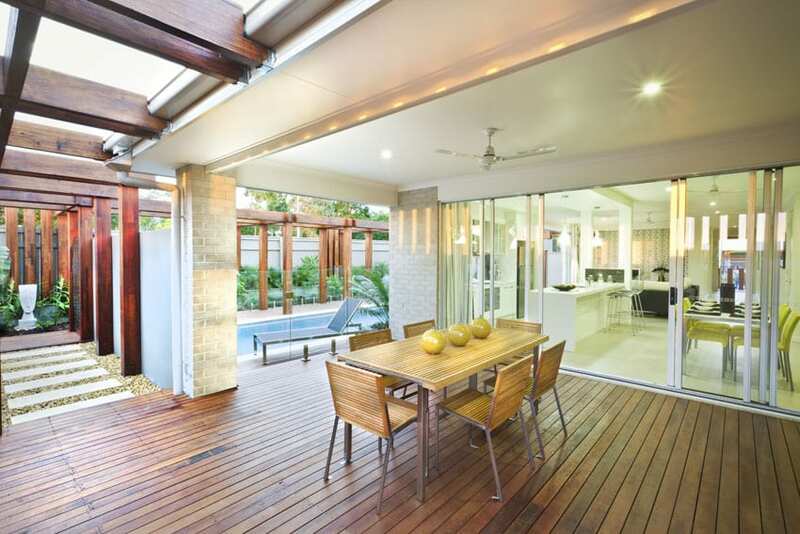 The large terrace area has an above-ground pool area, which is framed around by solid mahogany wood decking. On floor finish level, a separate area for lounge and dining was also finished with a wood deck, but using cedarwood planks instead, since the area is not as exposed to moisture as those around the pool is. 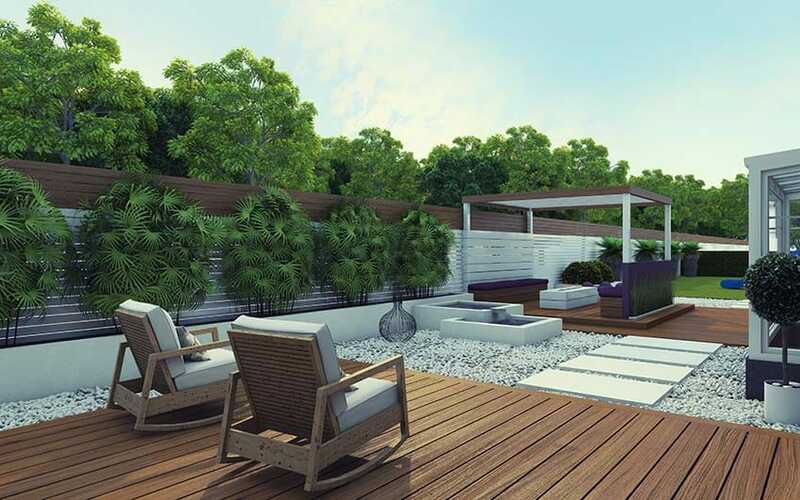 The contrast of colors of these two decking materials adds an interesting contrast to the open space. Wood decks are also applicable as a flooring material on semi-indoor patios. 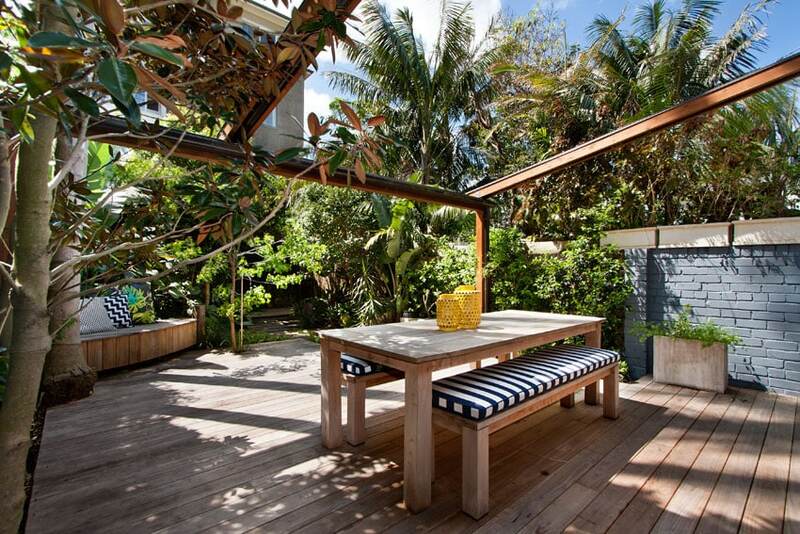 This example uses solid Brazilian teak wood decking, with a simple, smooth surface. The wood deck is extended beyond the roofed area as it connects to the pathway with solid Brazilian teak pergola, eventually leading to a pathway going to the pool area. 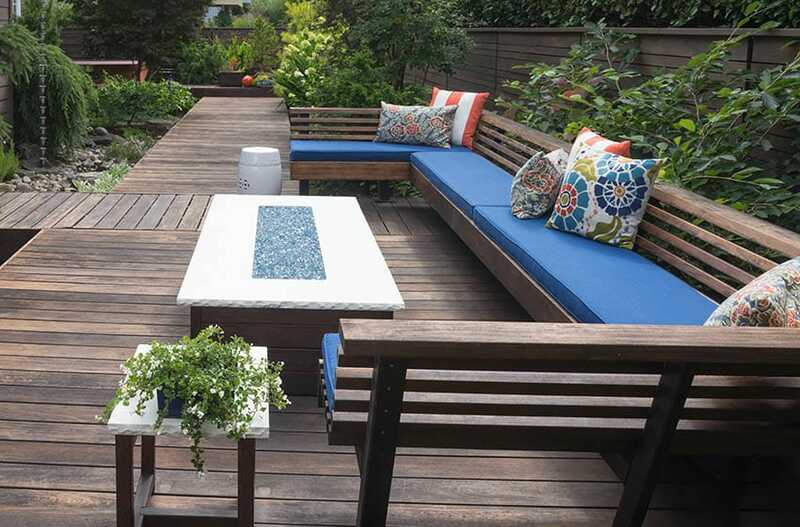 By adding a wooden deck to this small backyard garden, this outdoor dining area is more easily accessible for use all year round. The wooden deck not only adds an aesthetic value to the area, but because of the raised decking, the area is kept away from mud, water and most insects, resulting in a more friendly outdoor dining space. Another possible use for decking is by using it as a flooring material for bridges over the garden water feature. In this example, a pair of solid wood deck design platforms were used to connect different areas of the backyard from one another. This results in a very engaging and interactive design that is both functional and stylish. Decks not only come in planks, they also come in tiles with easy snap-on plastic base for easy installation. 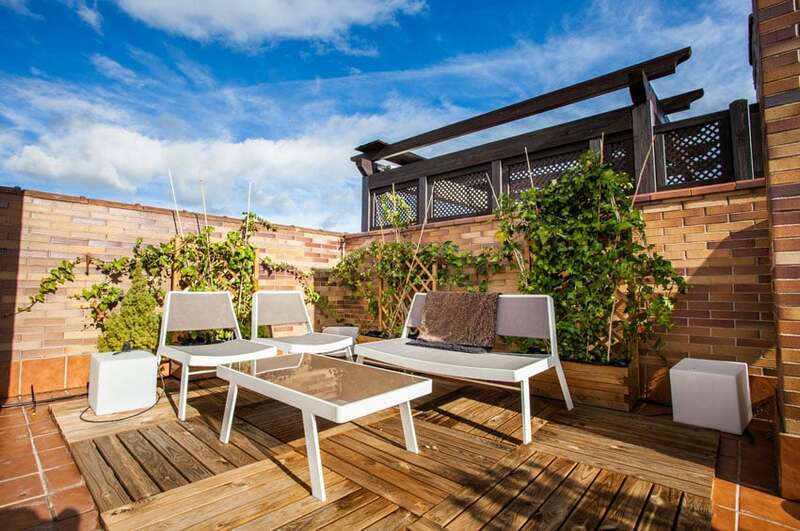 This example features a terrace which was fixed with modular decking made of composite boards. The modular design is quick & easy to install. You can also easily trim them down to size, and create interesting patterns as well. 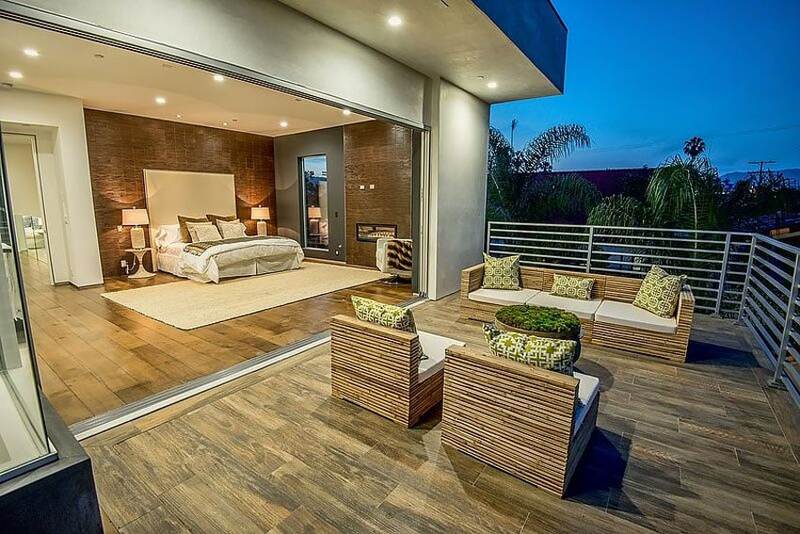 Wood decking can also be applied on walls as an accent, adding texture and pattern to the surface. This example uses weathered PT lumber for a low-cost accent wall. As this accent wall is placed beside the outdoor grill, a stainless steel sheet was added on the wall near the grill to protect the wood from heat/accidental burning. Designed around a cozy pebbled area beside the pool are two raised decks made from solid redwood framing and PT lumber planks for the decking. The raised deck resembles a four-poster bed, which fits 2 outdoor lounge chairs. The very simple pergola structure can be fitted with a canopy or curtains for extra protection from the sun or rain, and is placed in a location which is able to enjoy the best views. Instead of keeping the usual wood finish, this covered patio area uses black-painted wood decking for its flooring, for a nice dark base which contrasts well with the horizontal Mahogany planks used on the perimeter walls. You don’t really have to remove or replace existing flooring material to have a modern deck area in your home. The above photo is a great example of how you can integrate wooden decks into the existing finishes of your patio. This example uses 600×600 modular tiles of solid wood deck, and was simple placed on top of the existing terracotta tiles. After adding some modern outdoor furniture pieces and some accent plants, you already have a simple & functional modern decking. This multi-level deck was made to be the focal point of the backyard. Solid hardwood framing combined with PT lumber wood deck creates a natural & earthy feel to the deck area, naturally blending in with the garden. 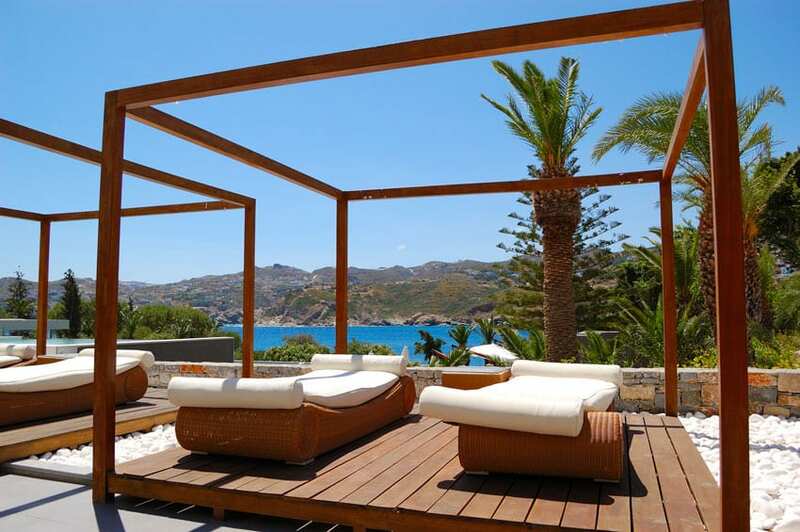 For more functionality, 2 outdoor chaise lounges were added, but the spacious area could also be furnished with other outdoor furniture pieces as per required. To blend in with the rustic feel of the architecture, this patio area used weathered solid wood decking , with accent gray & white Machuca tiles with a Moroccan quatrefoil pattern for an eccentric modern touch. This expansive outdoor patio was fixed with high quality solid teak wood decking, with a clean smooth finish. The simple yet elegant look goes along well with the modern architecture of the house, as well as the modern furniture pieces used. For the ultimate in outdoor living this modern wood deck is directly outside the master bedroom through large sliding doors to maximize views and create an impressive design feature. Stainless steel horizontal fencing further enhances the modern appeal. 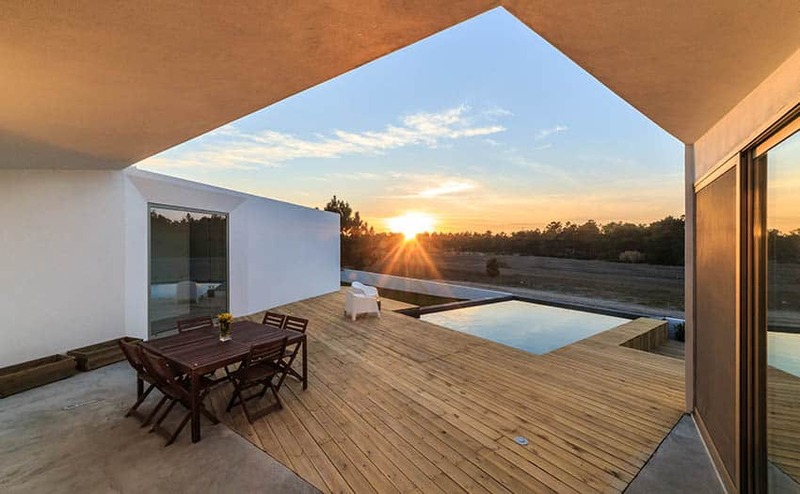 This ultra modern home features an inviting backyard wood deck with plenty of space for sunbathing and star gazing. A white modern retaining wall separates the garden landscaping from the deck area. For spaces like this terrace, using modular wood deck tiles is the easiest and quickest option to add a deck to your space. As these are made up of square tiles, they are easily installed, maintained & replaced by just snapping the pieces together or snapping them off for replacement. This cozy fire pit is built-in on an elevated deck area made from aluminum deck which was powder-coated in a pale rustic wood finish. The same material was used to create the built-in bench and the base for the firepit itself. Lighting was also integrated into the design, as well as removable cushions & pillows for added comfort, and a sound system for a complete ambiance. 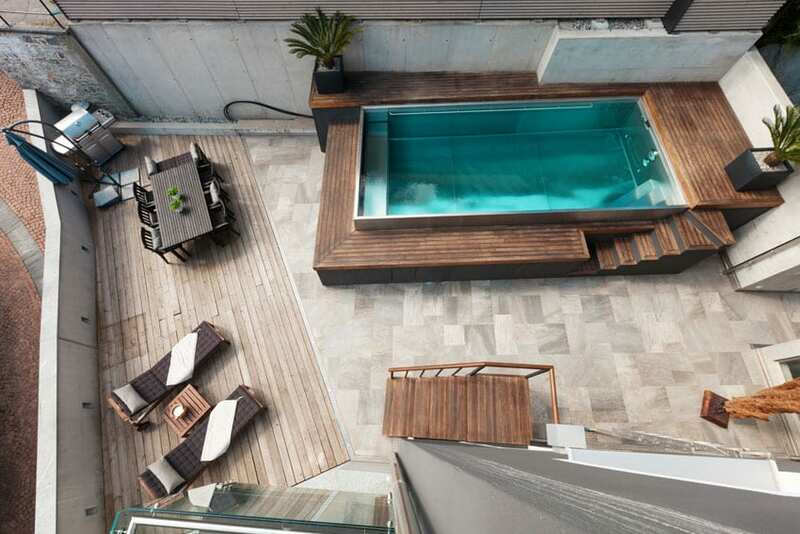 For this modern pool area, a “floating deck” feature was added to enhance the look of the pool. On one corner of the pool area is a gazebo with a solid redwood decking and outdoor sofa set. It has integrated lighting under the deck & a wide fountain/waterspout, giving a mysterious illumination to the pool. On its opposite corner is another raised deck area with its other half seemingly “floating” above the pool, the the other firmly attached to the finished flooring. It uses the same solid redwood decking & a solid redwood framing to match. Inground lights were also integrated into the design for both safety and aesthetics. This gorgeous modern minimalist home includes an above ground square pool area attached to the structure through a raised solid cedar wood decking. The light and rustic color of the wood decking complements the concrete finish of the main flooring as well as the plain white paint used on the exterior walls. The natural tone of the wood adds warmth & texture to the small outdoor area. Another creative use of modern decking is the example above. It uses the decking as a bridge or a walkway that passes through the pond, connecting the outdoor patio area, as well as the other parts of the house. It uses lightweight composite boards placed on a metal framing and metal stilts for a solid and durable base. 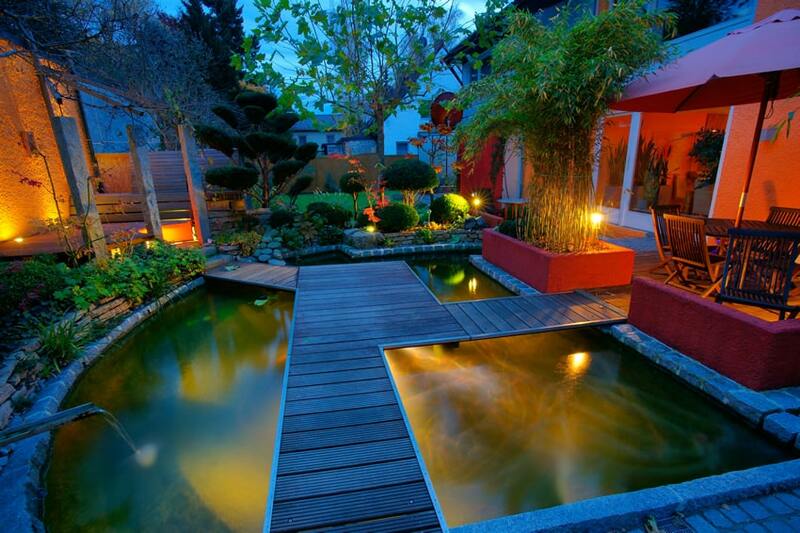 The underwater lights on the pond area provides sufficient light to illuminate the pathway. A closeup view of the modern wood deck design showcases the large wood cushioned bench surrounding a rectangular gas fire pit. Perfect for nighttime entertaining, a gas fire pit is a great way to enhance your backyard and create a place to hangout, have fun and socialize with friends and family. Visit this page to find more backyard deck ideas for your home.